My brief brush with rock stardom. The autumn of 1973 seems to me like a lifetime ago: before finishing college, long before a job in television. I was pursuing “musical stardom” as the lead singer of an eight-piece band made up of my former high-school classmates in Texas. We were playing clubs across the south and our current gig was at a well-known night spot in Macon, GA called Uncle Sam’s. Southern Rock was the rage, the Allman Brothers’ single “Ramblin' Man” was climbing the charts, and there we were, spending the week in the birthplace of Capricorn Records and the mecca of the Southern Rock sound. We had begun our week-long stay by opening for The Marshall Tucker Band, so we were a little giddy and star struck already, and we still had a couple of nights to go at the club. Most of us had not yet seen our 21st birthdays (one band member hadn’t yet turned 18), so we were pretty green and inexperienced. But our band had a nice sound and we had been well-received in Macon, even though our style was a long way from what you’d call Southern rock. “Uh…YEAH!” We all replied together. "Good," the owner said. "Just call him up when you're ready." Suddenly we had the attention of everyone in the room. People leaped out of their seats and rushed the stage. From the shadows, the familiar face I had known only from record album covers broke through the parting crowd, stepped up into the lights, and with a wry smile asked Tony, our lead guitarist, if he could play his Gibson Les Paul. Tony was surprised Allman hadn’t headed for the organ, but he didn’t hesitate in turning over his most prized possession to this rock god. Allman turned to my friends and simply said, “Let’s do some blues; follow me,” and he launched into a three-chord jam. I grabbed my Kodak Instamatic camera and took pictures until my flash cubes were gone as Allman guided my buddies through several blues numbers. He hardly said a word to the audience or to us between songs, occasionally laughing at my fellow band members’ jokes about his possibly coming on the road with us. I recognized only one of the songs he initiated, T-Bone Walker’s “Stormy Monday” that the Allman Brothers had expertly performed on their live album "At Fillmore East." But who cares if he wasn’t playing his hit records? He was on stage with my band and obviously having a good time--almost as good a time as we were having. Too soon, the magic was over. When Allman's last song with us ended amid thunderous applause, he turned and smiled at each of us, shook our hands, and with a simple “thank you,” stepped off the stage and was gone. When the band got home to Texas several weeks later, we had fun showing our friends the pictures of us performing with the MAN. But I don't think anyone other than the eight of us really understood the elation we felt from having made music with a true rock star. Where are those pictures today? I wish I knew. Alas, because of time and countless moves across the country, most of those priceless snapshots have been missing for several years, though a couple of my former bandmates still have one or two. But I have a secret wish that someday after I’m gone, my kids will go through my things and stumble across some blurry photos of a guy with flowing blonde hair, eyes closed, wailing on an electric guitar, as a bunch of long-haired kids surround him on stage, some laughing, some gawking, but all absolutely having the time of their lives. Have you had a brush with someone famous? Scroll down to Hit "Leave a comment" and share. 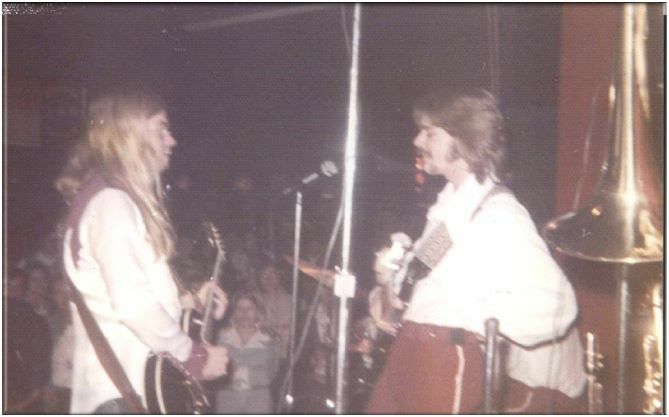 Gregg Allman with our bass player Chuck, taken with my Instamatic camera.